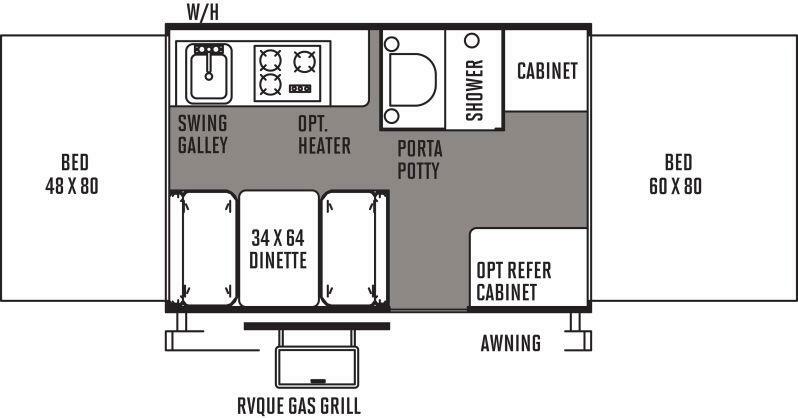 When you enter the unit, to the left you will have a 34" x 64" dinette with bench seating that converts into a bed. At the back wall you see the kitchen with a swing galley, 3 burner stove and sink. There is also a cassette toilet and shower as well as a cabinet. On the left side of the unit there is one pop-out bed measuring 48" x 80" and on the right side is a second bed measuring 60" x 80".